CHICAGO – How often can we learn life lessons from the most unlikely of sources? 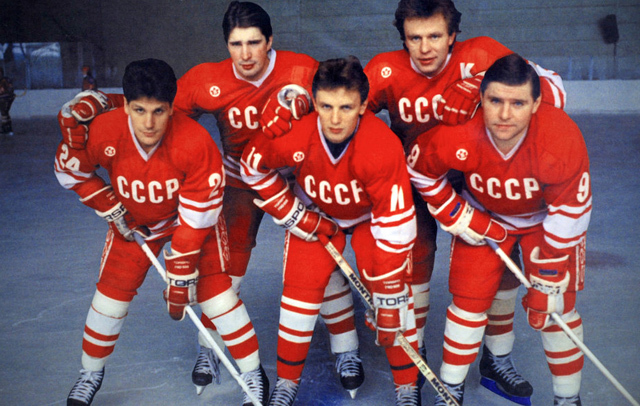 The documentary “Red Army” is one such source, as director Gabe Polsky tells the story of the Soviet Union hockey team, which expands to the the very parameters of human nature and competition. There is something poetic about the way the leadership in the Soviet hockey program conducted their vision, and Polsky was able to capture all the poetics within the development, nurturing and victories that the teams experienced – from the 1950s through the 1980s – and the psychology of it all. If this sounds strange it’s supposed to be. It was like delving into a prism, and the closer the introspection became, the more complexity and truth was revealed. The fall of the Soviet Union also had a profound impact on the foundation of the team, as the purpose of performing for nationalism is replaced by the NHL and pay-to-play contracts. There are lessons galore in “Red Army,” and it also is a fascinating tale of history. The story is told through the eyes of Slava Fetisov, a veteran of both the NHL and the captain of the last powerful gasp of the Soviet hockey teams of the 1980s. The history of Soviet dominance in the sport is chronicled, as the most prominent coach post World War II, Anatoli Tarasov, reinvented the way that hockey was taught, strategized upon and put into the field of play. The Soviet teams won seven gold medals in the Olympics from 1956 to 1988, interrupted twice by the Americans in 1960, and the “Miracle on Ice” USA team in 1980. Since the Soviet Union fell soon after the 1988 games, the team hasn’t won a gold medal since. Through those Cold War years, it was the combination of innovation, precise players and nationalistic pride that produced champions, and after it was over, what happened next was just as intriguing.